In an interview with Telemundo’s Jose Diaz-Balart on Tuesday, President Obama said that it would be difficult to halt the deportation of immigrants living in the country illegally without the approval of Congress. Immigration rights advocates have pushed the president to halt deportations through an executive order, especially of immigrants who haven’t committed any serious crimes. Last summer the administration did just this for young unauthorized immigrants brought to the country illegally as children with the creation of the “Deferred Action for Childhood Arrivals” program. Known as DREAMers, more than 500,000 young unauthorized immigrants have taken advantage of the administration’s program. Our 2012 survey of Hispanic adults found wide approval (89% approved of this new policy). A Pew Research Center survey of the general U.S. public found that 63% of U.S. adults approved of this program as well. 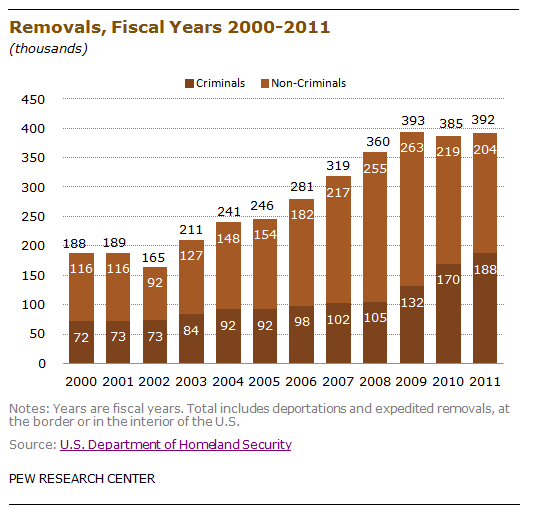 But deportations of unauthorized immigrants continue at record levels. In 2011 some 392,000 immigrants were removed from the U.S., according to the Department of Homeland Security. Among them, 48% were deported for breaking U.S. laws, such as drug trafficking, driving under the influence and entering the country illegally. The Obama Administration has deported more immigrants annually than the George W. Bush Administration. Most Hispanics disapprove. When asked about the Obama administration’s handling of deportations in a late 2011 Pew Research Center survey, 59% said they disapproved while 27% said they approved. According to the same survey, 41% of all Hispanics, and 55% of Hispanic immigrants, were aware that more immigrants had been deported under the Obama Administration than the Bush Administration. The Latino vote played an important role in the 2012 presidential election. A record 11.2 million Hispanics voted, supporting the president over challenger Mitt Romney 71% to 27%, according to exit polls. For Latino voters, the issue of immigration ranks as an important issue (though in 2012 it trailed others such as the economy, education and health care).